The heavens looked cold as the low clouds hung heavy with snow and hail. 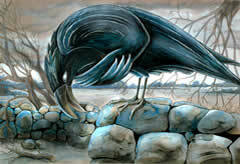 Perched on the fence, the raven screamed, "Caw, caw!" and trembled with cold. It made one shiver to think of it.